Four our sixty-sixth meeting we went pickled! 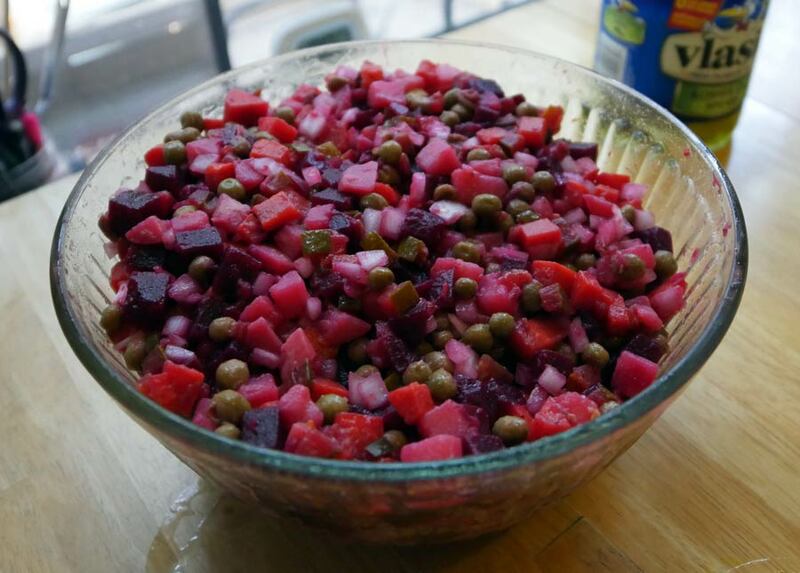 Shannon made a beet salad a host of hers had once prepared for her while she was living in Ukraine serving in the Peace Corps. She started out by boiling three fresh beets with the skin still on, then reduced the heat to a simmer to cook for twenty more minutes. After that she added a similar quantity of carrots and potatoes, also both unpeeled, to the pot. She boiled these for ten minutes then removed them from heat to sit over night. In the morning, she peeled and diced the vegetables and combined them with chopped pickles, peas, and an onion that had been sliced, soaked in water, then chopped. She dressed the beet salad with olive oil, salt, and pepper. 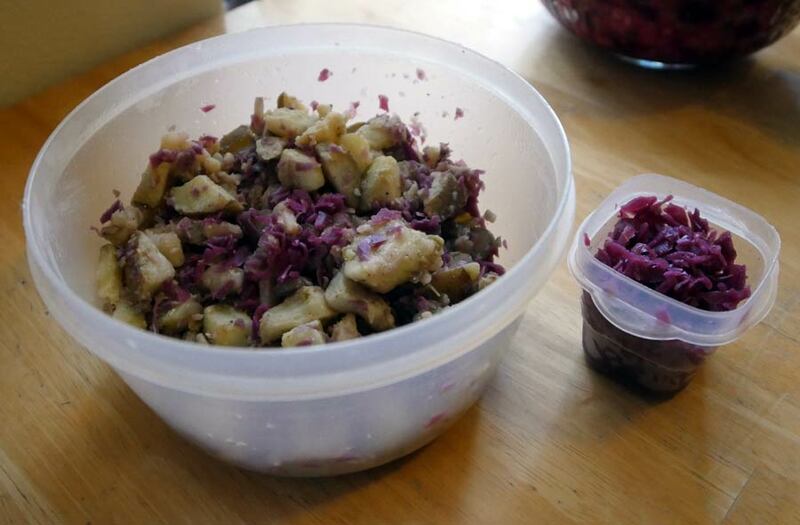 For her pickle-y potato and cabbage salad, Lilly boiled organic red potatoes with the skins on, then chopped them up, and tossed them in a container with olive oil, garlic paste, and Himalayan pink salt. Then she crisped the potatoes in the oven and let them cool. 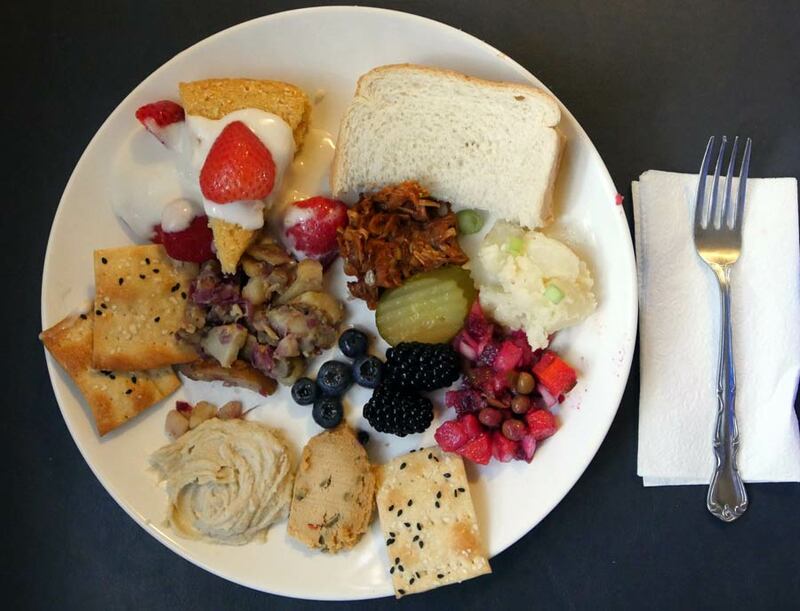 To turn it into a salad, she added about a tablespoon of horseradish mustard, three diced Persian pickles, and part of a jar of Polish red cabbage salad that contained red cabbage, water, vinegar, sugar, cinnamon, and cloves. Lauren made a pickling liquid with one cup each of white wine vinegar, Zulka Morena Pure Cane Sugar, and water plus the juice and zest of one lemon, lots of cinnamon, and a little bit of nutmeg. She poured it over blueberries and blackberries and let them sit overnight. 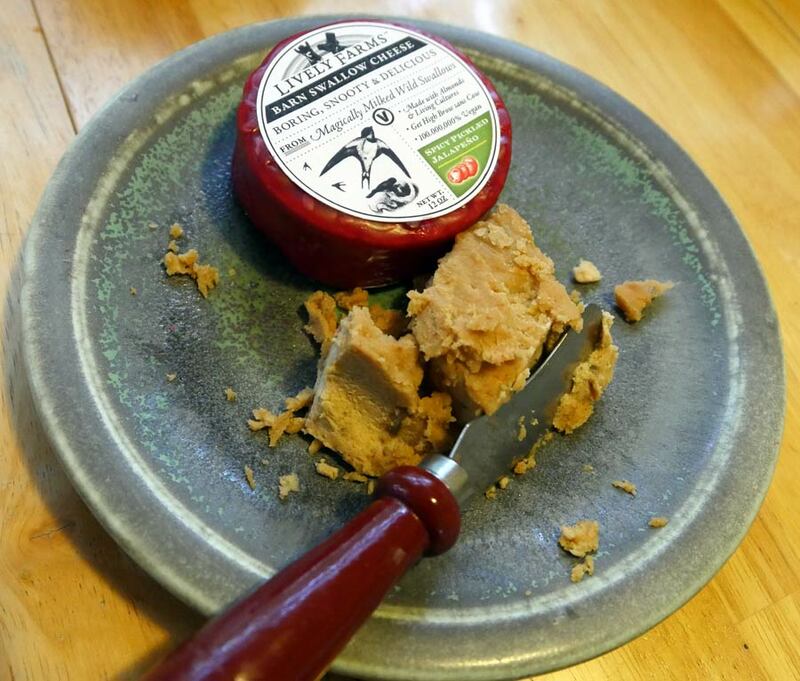 She made a cashew cheese spread with soaked raw cashews, the juice and zest of one lemon, Zulka Morena, and salt. Inspired by Great British Bake Off, she made homemade crackers from a dough of 3 cups flour, 2 teaspoons sugar, 2 teaspoons salt, 1/4 cup extra virgin olive oil, and 1 cup of water. 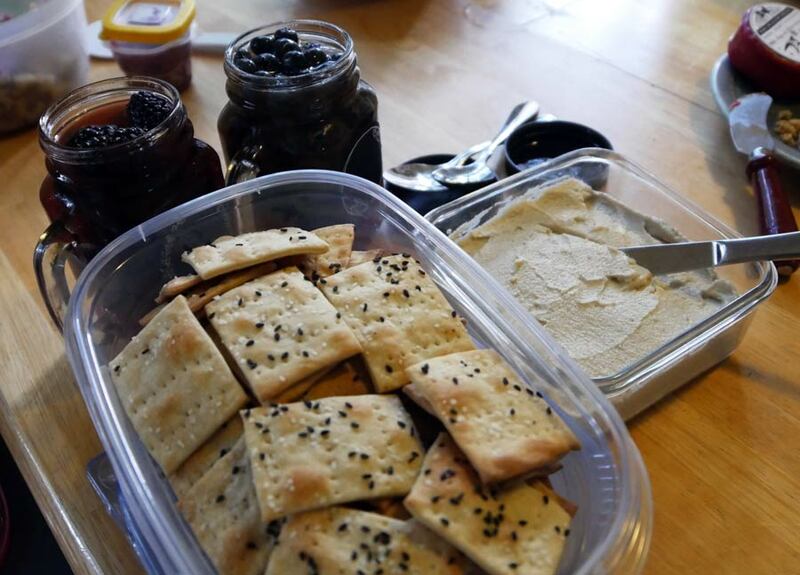 She topped the crackers with coarse salt and black sesame seeds. 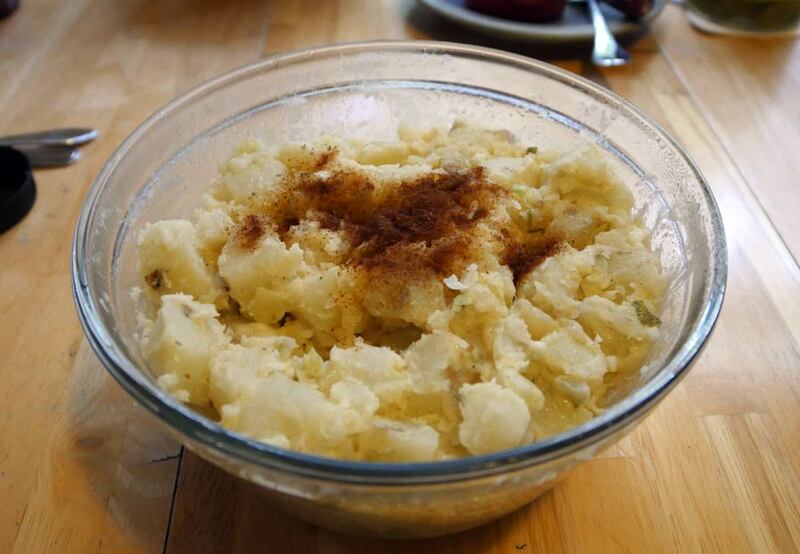 Caroline made a potato salad with russet potatoes, vegan mayo, pickle juice, diced pickles, ground mustard, paprika, salt, dill, chives, and green onions from a recipe she found at Cadry’s Kitchen. To make vegan pulled pork, Drew used Trader Joe’s Jack Fruit (packed in brine because the packed in water kind was out) mixed with Trader Joe’s barbecue sauce, water, garlic, chopped onion, paprika, onion powder, garlic powder, and liquid smoke. He simmered the jack fruit for thirty minutes then tore it apart with a fork. 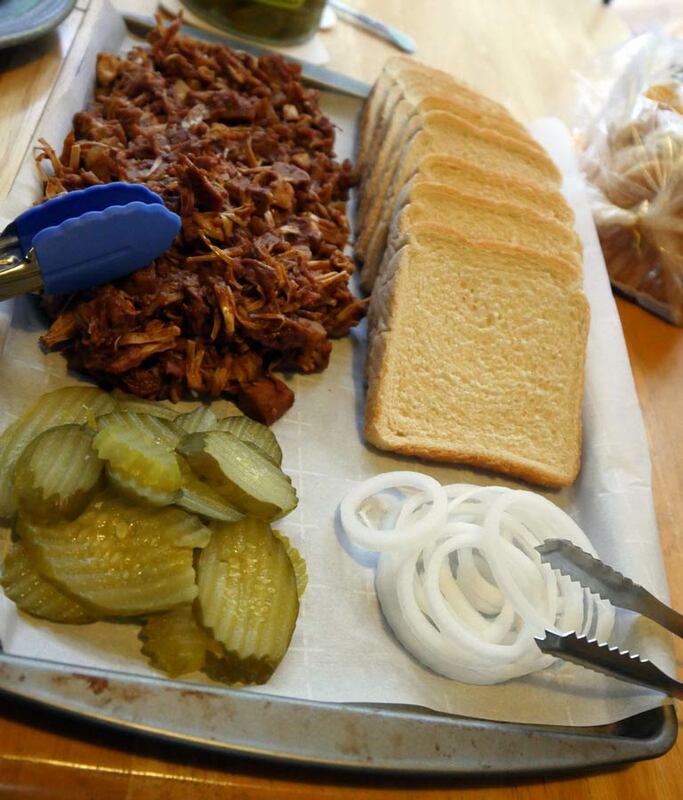 He served the vegan pulled pork with white bread and pickles. Slynn pickled strawberries in white balsamic vinegar, white wine vinegar, sugar, water, and salt. The cake she made was a polenta cornmeal cake that she flavored with orange zest. She also made a coconut cream glaze to serve on the side. 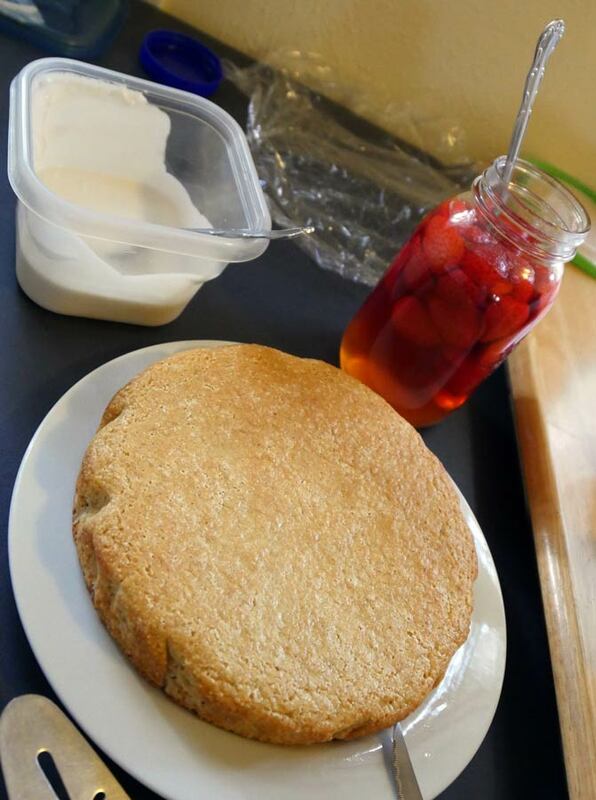 Billy sprouted quinoa in aquafaba to concoct the rejuvelac that gave his vegan cheese its tang. He added it to boiled almonds, and pureed it with water, lemon juice, soy yogurt, coconut oil, olive oil, pea protein, nutritional yeast, and spices. For a final flavor-adding touch, he stirred in some sliced pickled jalapeños.